Angelman syndrome is a severe neurological disorder characterized by developmental delays, epilepsy, and problems with motor coordination and balance. 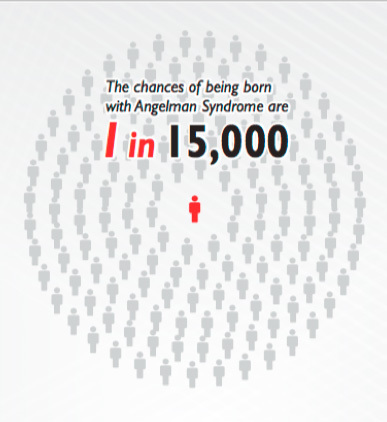 It is named after a British pediatrician, Harry Angelman, who first described the syndrome in 1965. Individuals with AS do not develop functional speech. The seizure disorder in individuals with Angelman syndrome can be difficult to treat. Feeding disorders in infancy are common, and some persist throughout childhood. Sleeping difficulties are commonly noted in individuals with Angelman syndrome. AS affects all races and both genders equally and occurs in approximately one in 15,000 births. People living with AS have a normal life expectancy but require life-long care, intense therapies to help develop functional skills and improve their quality of life, and close medical supervision often involving multiple medical interventions. Individuals with Angelman syndrome tend to have a happy demeanor, characterized by frequent laughing, smiling and excitability. Although the cause for AS is known, there currently are no treatments available for this disorder. No cure is available.